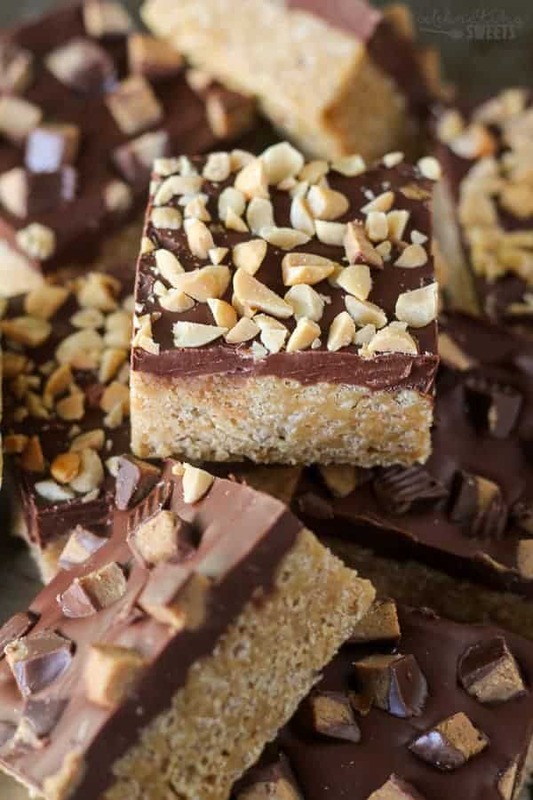 These Chocolate Peanut Butter Rice Krispies Treats were created as part of a shop that has been compensated by Collective Bias, Inc. and its advertiser. All opinions are my own. I’m breaking the rules today. I am taking a recipe that my family has made for years and years and I’m putting my own spin on it. Cue eye rolls from my family members. The fact is, I have a lot of trouble following a recipe as written. Since I cook, bake and create recipes frequently am I always thinking about how a recipe can be improved. Some classics shouldn’t be messed with. I can appreciate that, but sometimes a few switch-ups can take a recipe from good to great. 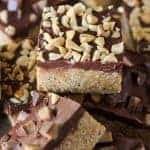 My mom has been making a version of these Chocolate Peanut Butter bars every holiday season since I was a child. 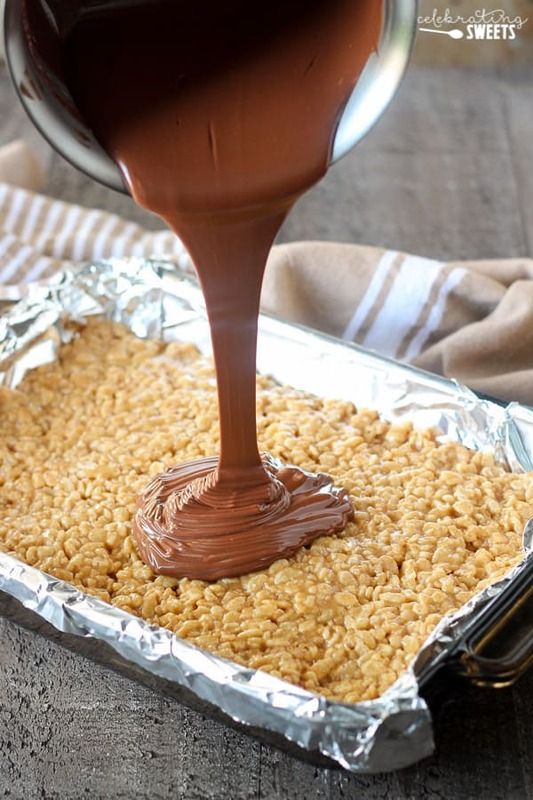 It is a chewy peanut butter Rice Krispies® bar topped with a mixture of melted chocolate and butterscotch chips. The sweet and creamy topping balances the chewy and slightly crisp bar underneath. It’s a fantastic combination of flavors and textures. One bite of these bars brings back vivid memories from the holidays of my childhood. I love how food has the ability to flood me with happy memories; it’s one of the best reasons I can think of to get into my kitchen. These bars are very similar to the ones my mom has always made, with just a few changes. 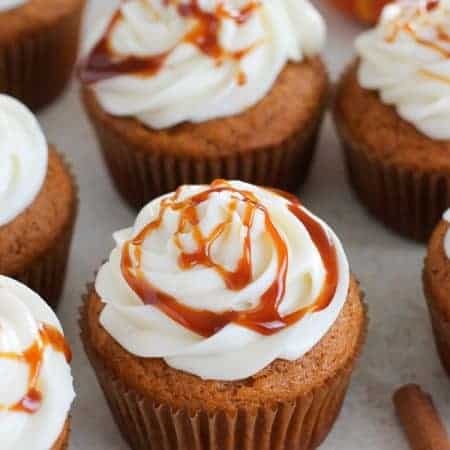 I swapped some white sugar for brown sugar (deeper flavor! 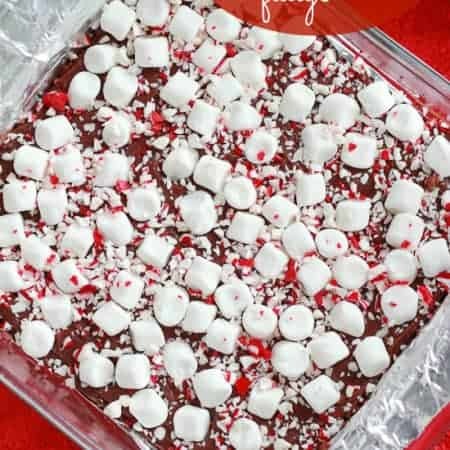 ), I used dark chocolate in place of semisweet chocolate, and I added a fat pinch of sea salt for a nice sweet/salty balance. I also added a topping of roasted salted peanuts and/or chopped peanut butter cups. 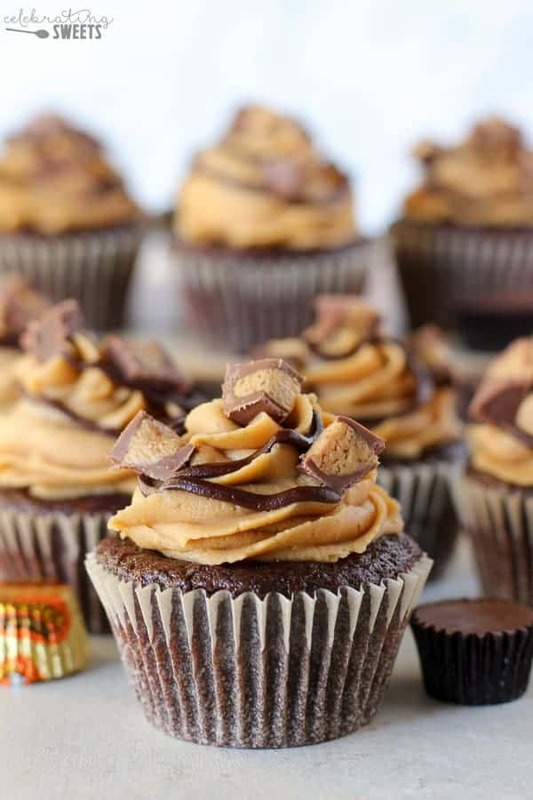 I love the salty crunch of roasted peanuts on top, but if you’re a fan of peanut butter cups, you can throw those on top as well. Use either, neither, or both – whatever you prefer. 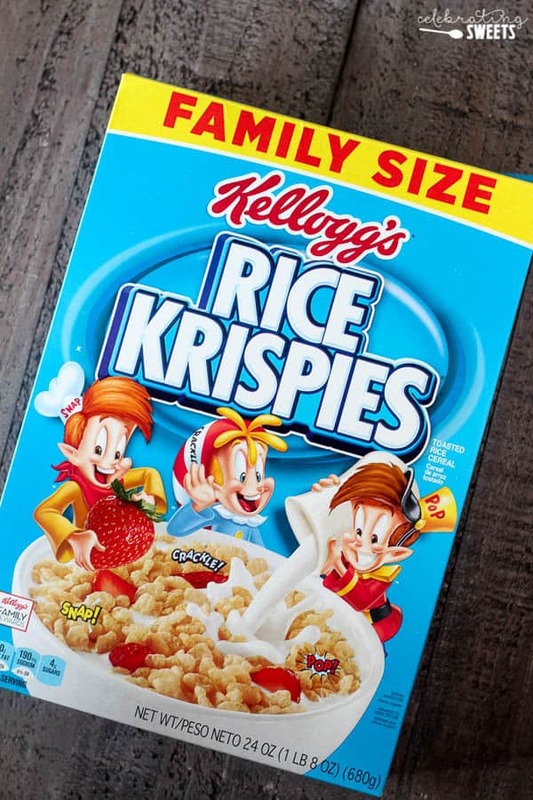 Pick up some Kellogg’s® Rice Krispies® to make these simple no-bake treats this holiday season. Call your family into the kitchen, get your kids involved, and throw together this easy recipe. You’re only a few steps away from enjoying this delicious twist on Rice Krispies® treats. Line an 8.5x11 or 13x9-inch baking pan with parchment paper or foil (if using foil, lightly grease it). Set aside. Place the corn syrup and sugars in a large saucepan over medium-low heat and stir to combine. Bring to a boil, stirring constantly. Once boiling, remove from the heat and immediately stir in peanut butter and a pinch of salt. Mix until well combined. Quickly stir in Rice Krispies. Spread into the prepared baking pan. I lightly grease my palm and press the mixture into a flat layer. In a small saucepan over low heat, combine chocolate chips, butterscotch chips and peanut butter. Cook, stirring frequently until completely melted and smooth. Pour over the top of the bars. If topping with peanuts you can sprinkle them on right away. 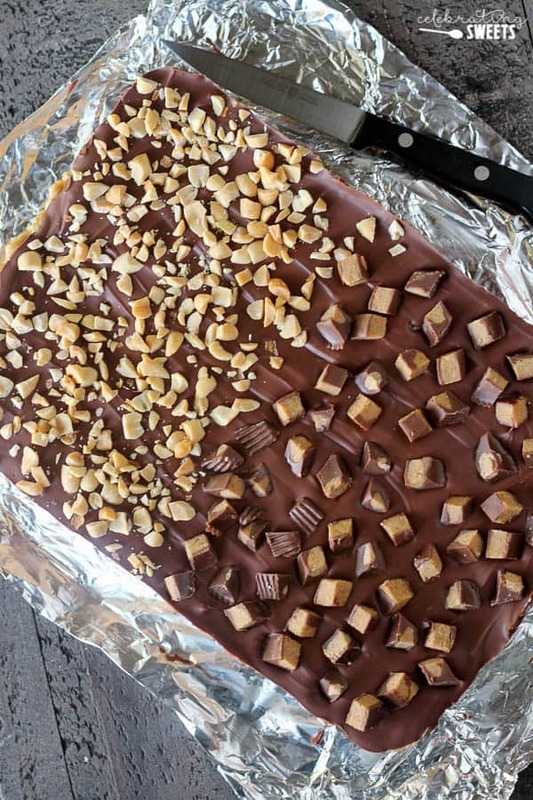 If you're topping the bars with peanut butter cups, allow the chocolate to cool slightly (but not all the way) before adding the peanut butter cups. The bars pictured were made in an 8.5x11 pan. If you use a 9x13 the bars will be slightly thinner. The more you pack the mixture down into the pan the more dense the bars will be. For a lighter bar, press gently. Oooohhh these look awesome! I need them in my life STAT! I love rice crispy’s!! They are so good. i need to try these like asap. I have to print this recipe. 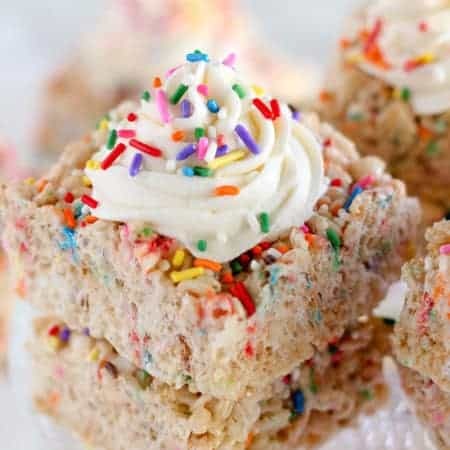 These Rice Krispies treats look delicious! Okay, I’m all about Rice Krispie treats, so I can’t even! 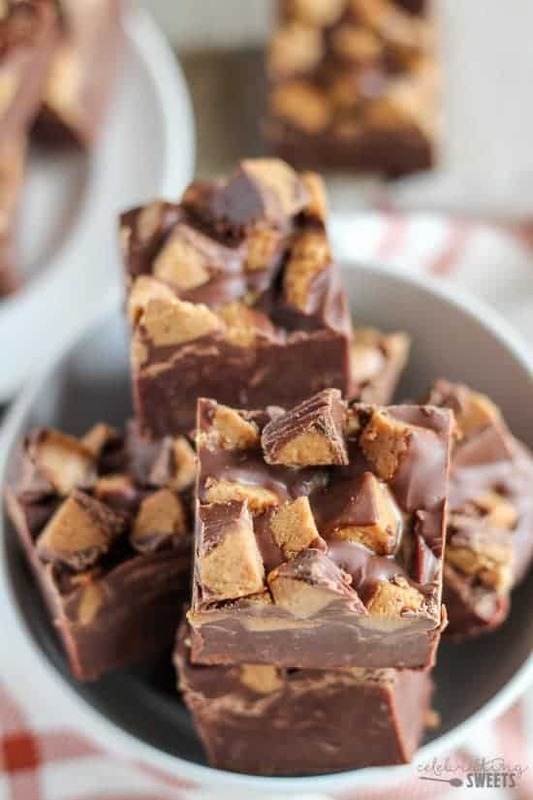 I mean, the addition of chocolate peanut butter def puts it over the top for me can’t wait to make these. Just in time for the holidays! Well, thanks! 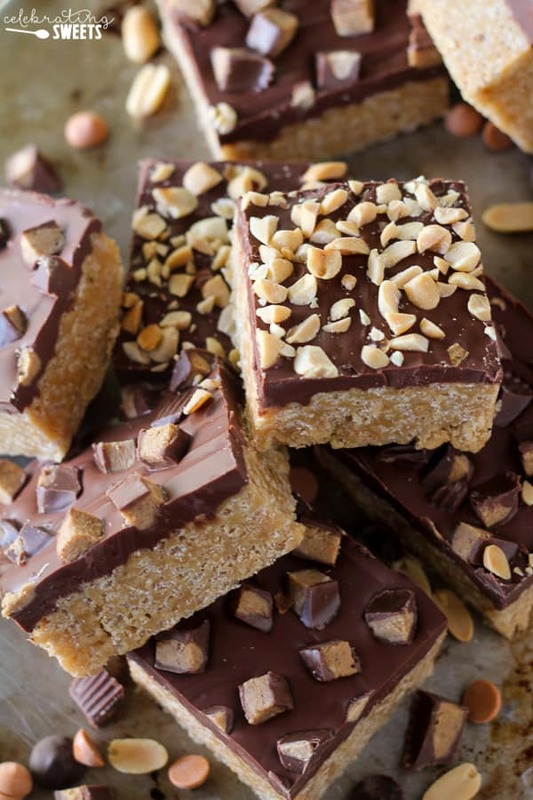 I can’t UN-SEE these peanut butter, chocolate, butterscotch, sea salt, killer snack bars. My skinny jeans are in full-on retreat! 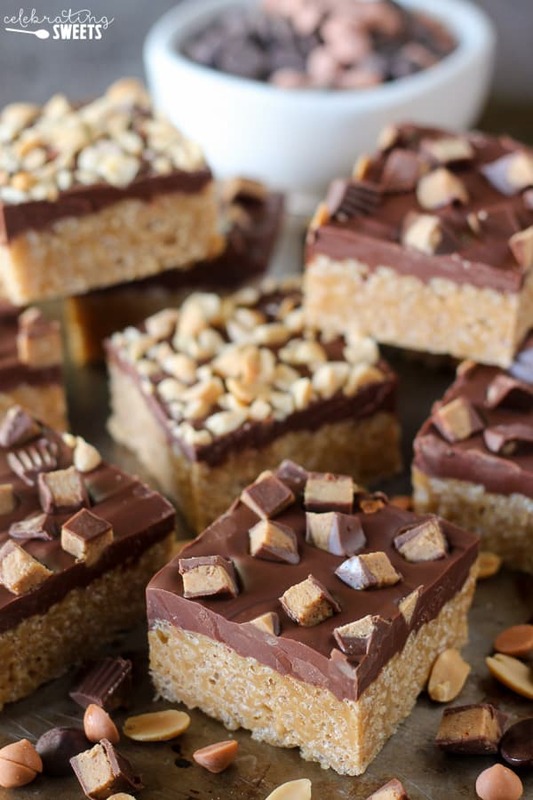 These look fantastic – takes a Rice Krispie treat to a whole new level! Thanks! Sorry to hear that. If the filling was hard, like toffee, my guess is that it cooked too long on the stovetop. Also, if you pack them into the baking dish too tight they will be much more dense (as mentioned in the recipe). Thanks for leaving your feedback. Awesome!!! So much better than using marshmallows=my kids, young and old, Love these!